Tangled and True: get in gear. 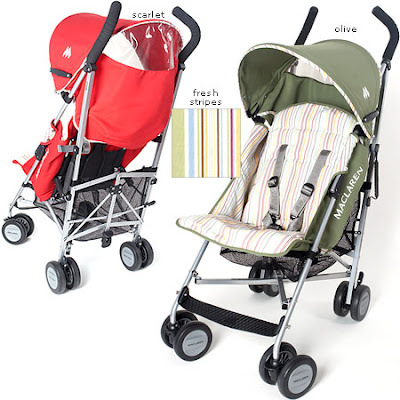 I'm really liking this Fresh Stripes Maclaren Quest Stroller (and exclusive to Babystyle) for a fresh, lightweight option. Does anyone have experience with Maclaren strollers? I'm a huge fan of the one I have (Phil and Teds) but a second (lighter and more compact) stroller is something we've considered. I don't have the MacClaren, but I do want the lightest one for vacation. It is called the Volo. I've heard they are really good, smooth wheels, comfty for baby etc. I have the Peg Perego Aria--it is pricey but only weighs 9 lbs! I love the range of colors--soleo (orange), toffee, mint, anise (light blue), and rose. It also comes in a twin stoller that is great too and maybe worth the money if more kids are in your future.